You don’t need much equipment to build a home gym that will give you everything you need for a complete workout. 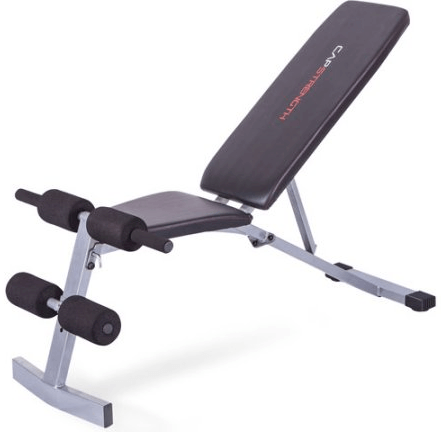 All you need is an adjustable, multi-purpose workout bench and some free weights. Free weights are better than machines because they force you to use a wider range of muscles. They also help to strengthen your balance in the positions in which you train. What I mean by an adjustable bench is one where the backrest raises and reclines to different positions. This will allow you to work more muscles and increase the concentration on others. The multi-purpose aspect is a bench that you can use for free weight training and for other things such as abdominal exercises. You don’t need barbell weights. Those are the weights that are attached to a 5-7’ steel bar. They take up too much room and the number of exercises that you can do with them is limited. I am suggesting that you use dumbbell free weights. You hold this kind individually in each hand. There are adjustable dumbbells and fixed-weight dumbbells. The adjustable dumbbells allow you to add or remove plates to increase or decrease the weight. 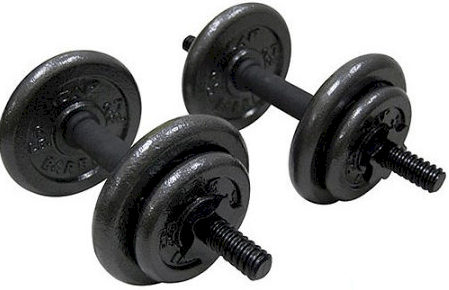 Fixed-weight dumbbells come in one solid piece in various standard weights. I prefer the adjustable dumbbells. They allow you to add weight to them as you progress or reduce the weight if you need to for any reason. The dumbbells are used for almost all the resistance training exercises that you’ll perform using this home gym. You can get a full workout using just two (2) different weight amounts. It’s not advisable to do all of them using just one weight unless that weight amount is very low. There are benefits to using low weight amounts. Low weights are good for improving tone and definition. If you want to increase the size of your muscles, you’ll need to increase the weight. Some muscle groups can handle more weight than others can. To streamline your workout and eliminate the hassle of changing weight plates, I recommend that you get at least two (2) sets of dumbbells and plates of different weights for your home gym. I got my workout bench ($49) and one (1) set of adjustable dumbbells ($38) at Walmart in January of 2005. (Current prices, product names, and colors may vary.) I got a second set of dumbbells at a garage sale ($15). Total cost for my home gym: $102. The advantages to this home gym are that it’s compact, inexpensive, and multipurpose. Additional items that you might consider are power-grip gloves ($9) and a tiny MP3 player with a belt clip or carrying case and headphones. The portable style and headphones will allow you to play the music as loud as you want without disturbing anyone else. It also gives you convenient access to the controls. What’s great about ordering products online at Walmart.com, is that you can get your entire order shipped to the store nearest your home for free! This service is called “Site to Store.” If you are unhappy with your purchase for any reason, you can simply return it to the store and get a full refund. To avoid injury and get the best results in the shortest amount of time, I recommend that you hire a personal trainer and/or get a couple of good books on how to use free weights properly. Here are some books worth considering. The TG is the best home gym machine I’ve ever used. It uses your body weight to produce resistance, which is more efficient and safer than iron weights. Although the TG takes up a bit more space and is more expensive than my current home gym, I recommend it over any other product. If you’re a fitness enthusiast, you know that a health club is a good place to learn how to workout properly and meet like-minded people. There some disadvantages, however, that are overcome by having a home gym. First, I give you the advantages to a health club membership. Opportunity to meet other like-minded people. Access to state of the art machines. Access to a wide range of free weights. Access to various fitness classes. Motivation that comes from exercising with other people. Here are the advantages to having a home gym (instead). Saves time and gas by not having to drive to the club. Eliminates the frustration of finding a parking place at the club. Don’t have to wait in line to use the equipment. Don’t have to touch other peoples’ sweat while using the equipment. Can avoid illnesses by not coming into contact with high traffic surfaces. Can listen to the music you want and not what the club staff wants. Can workout any day and time that you want. It took me a while to get into the habit of using my home gym, but now that I have, I find that I am training more efficiently and consistently. Having a home gym has strengthened my self-discipline. If your goal is to become the quintessential fit man or woman, I would suggest that you do whatever is best for you now. If you need personalized instruction on how to workout with free weights properly or you need the inspiration of others exercising around you, then I would suggest that you purchase a health club membership. I learned a lot at the health club that I attended. I learned not only from the instruction I received from a club staff member but also by observing others doing their workouts. Eventually, I found that I had gotten everything I could. Once I canceled my membership and got into the habit of using my home gym, I wondered why I hadn’t done it sooner. If you’ve gotten everything that you can from your health club or if you want more privacy and convenience, I would strongly suggest that you consider investing in a home gym.